In December of last year scientists warned that California would fall dramatically making it more susceptible to drought and wildfires. The latest study adds a worrying dimension to the challenge California is already facing in adapting to climate change, and shifts focus to melting polar ice that only recently has been discovered to have such a direct, potentially dramatic impact on the West Coast. While climate scientists generally agree that the increased temperatures already resulting from climate change have seriously exacerbated drought in California, there has been debate over whether global warming would affect the amount of precipitation that comes to California. The study is yet another by federally funded researchers that finds the failure to more rapidly diminish greenhouse gas emissions could have a serious impact on California and other parts of the country. The findings contrast starkly with Trump administration policy on warming, which ignores the mainstream scientific consensus that human activity is driving it. I think everyone here is aware that the escalating climate change catastrophe is man made. I'm not sure how that knowledge translates into an effective political response. Maybe the NDP and Greens should merge? Canada is also facing droughts as a result of climate change. A study released in March 2018 looked at 29 different climate change models examining drought caused by global warming until 2100 would impact different regions of Canada in terms of precipitation both if greenhouse gas emissions grew unchecked and if they were significantly reduced. Southern parts of those provinces are vulnerable to drought, Barrie Bonsal, a research scientist with the Water Science and Technology Directorate of Environment Canada, agrees, and droughts could become more severe later in the century. Alberta will be particularly vulnerable as glaciers in the Rockies melt, ending a formerly reliable source of water. British Columbia's Okanagan Valley is one of the driest places in Canada, and agriculture puts pressure on water supplies. Climate change could mean even hotter summers in the region, making it more vulnerable to drought. "Most models show it getting drier toward the end of the century," said Barrie Bonsal, a research scientist with the Water Science and Technology Directorate of Environment Canada. British Columbia has been dependent on snowpack to provide moisture through the spring and summer, but it may get more rain in winter, which would run off the land rather than melting slowly as snow does, Bonsal said. The Lower Mainland of B.C. is accustomed to seeing lots of rain, but with places like the lower Fraser region and Vancouver Island seeing less of it, they'll have to rely more and more on water reservoirs, according to John Pomeroy, professor of geography and director of the Centre for Hydrology at the University of Saskatchewan. However, since those regions don't usually have to rely on reservoirs, he says, the ones they have aren't adequate to offset the lack of rain. In fact, the shortage has prompted water restrictions in the province and instances of hydrological drought, which is when lakes, rivers and ground water supplies are depleted. "The impact of climate change is being felt rapidly in the far North," Price said. "We could see a dry winter followed by a hot summer that would make drought quite possible." Northern parts of Ontario and Quebec are less influenced by the Great Lakes, and their forests could be threatened. "You only need a couple of years of very dry conditions to make those forests tinder-dry," Price said. That means elevated risk of forest fire. By contrast, Atlantic Canada and eastern Quebec are predicted to become wetter as the century progresses, under most climate change models. There are now 25 known dead and over 100 missing from the California fires in the last few days, with more than 250,000 under evacuation orders. The President of the California Professional Firefighters has ripped Trump for his comment on withholding federal funding to the states because of poor forest management. This is another attempt to deflect attention from how global warming is increasing levels of catastrophic damage when Trump denies global warming even exists. It also typical of his vindictive response to anyone who does not support him under any and all circumstances. The death toll from wildfires raviging on both ends of California has risen to 25. The so-called Camp Fire leveled nearly the entire city of Paradise, scorching thousands of homes and leaving its business district in ruins. More than 100 people are still missing after the wildfire decimated the town of about 27,000. While Jerry Brown has received praise for his climate change measures for his climate change measures, he also has been strong criticized for being too friendly to oil, not unlike Trudeau and Notley. Anti-oil protesters tried to shout down California Gov. Jerry Brown as he spoke at last November’s climate-change conference in Bonn, Germany, one of many interruptions in his appearances there. The occasionally feisty governor didn’t miss the opportunity to debate with the “Keep It In The Ground” campaign troops pushing for no new oil or gas drilling anywhere. To some it’s jarring to attack the environmental bona fides of a public figure who has been talking about conservation since the 1970s and has arguably signed more environmental legislation than any American governor. As state attorney general and then governor, Brown has championed regulations supporting clean energy, energy efficiency and a broad suite of laws aimed at reducing greenhouse gases that warm the planet. But not to R.L. Miller, chairwoman of the state Democratic Party’s environmental caucus and president of the political action committee Climate Hawks Vote, which supports environmental issues and candidates. She said Brown used to be a committed environmentalist, and she gave him credit for promoting solar energy, for example. But oil exploration is another matter, she said. Like many critics, Miller noted Brown’s controversial dismissal of the state’s top two oil and gas regulators in 2011, two days after they warned the governor that oil activities were imperiling the state’s groundwater. Industry representatives, who had complained that the state’s enforcement noose was pulling too tightly, welcomed the move. Brown never publicly gave a reason for firing the officials, who serve at the pleasure of the governor. Drought and above normal temperatures brought on by climate change have contributed to the most disastrous wildfire season in California history with 44 dead and 230 missing. Unforunately, future wildfire seasons are expected to get worse both in California and in Canada, especially in its boreal forest, which stretches across much of the country. The death toll has reached 42 in the Northern California wildfire, making it the deadliest in state history. Statewide the number of dead stood at 44, including two victims in Southern California, from wildfires raging at both ends of the state, ABC News reported. The wildfire turned the Northern California town of Paradise and outlying areas into hell on earth, equaling the deadliest blaze in state history, and the search for bodies continued Monday. Nearly 230 people were unaccounted for by the sheriff's reckoning, four days after the fire swept over the town of 27,000 and practically wiped it off the map with flames so fierce that authorities brought in a mobile DNA lab and forensic anthropologists to help identify the dead. Here's a review of the International Panel on Climate Change 2018 report. It isn't pretty. The Special Report tells us we’re screwed. Even to be a little less screwed, we’ll have to overturn everything in our society, politics, and economy — just to keep the global temperature from rising more than half a degree Celsius. That doesn’t sound like much, but an enormous amount of energy is involved in warming the planet by half a degree. Briefly, the IPCC argument runs like this: since the 19th century’s “pre-industrial” carbon dioxide levels began to rise, global temperature has risen about 1 degree Celsius. That one degree has brought us a shrinking Arctic ice pack, rapid melting of the Greenland ice sheet, dying reefs, rising sea levels, and some very extreme weather. The Paris Accord, which Canada signed, is intended to keep further temperature rise below 2 degrees by the end of the century, and to try to keep it as low as 1.5 degrees. This was on par with the “pledges” rich nations make to help poor nations recover from earthquakes and epidemics; somehow the money itself never arrives. Coastal habitats such as beaches, marshes, tidal flats and estuaries are vital to wildlife. Millions of birds – from 29 countries and three continents – rely on the Fraser estuary and mudﬂats of Roberts Bank and Boundary Bay, to feed and rest as they migrate along the Paciﬁc Flyway each year. For over 80% of BC’s wildlife – including wild salmon as well as birds – estuaries are essential during some part of the life cycle. These changes would also have massive impacts on the economy of our region, hitting especially hard at BC’s tourism industry, shellfish aquaculture and fisheries. Many of our Strait of Georgia communities and sensitive estuaries face flooding by rising seawater. Salmon runs will perish as they encounter the warming waters of the Fraser River and countless other streams. The cumulative impacts across the many watersheds that drain into our inland sea will change the Strait in ways no one can foresee. Complicating the issue, many of our coastal areas have already been developed, polluted, dredged or otherwise damaged. Dikes, seawalls and other structures have reduced the possibility for critical habitats to simply move inland to adapt to sea level rise – so we cannot afford any further losses in terms of coastal habitat. The damage already being done by global warming in the Georgia Strait region of BC is quite staggering and requires a major change in Canada's economy to avoid a catastrophe. The Strait of Georgia, part of the Salish Sea, is a beautiful and productive place. Our coastal waters support a diversity of species, rhythms of life, economies and communities. However, we can already see that human-caused climate change is having negative impacts in the Strait of Georgia and its watershed. Reports by the Intergovernmental Panel on Climate Change (IPCC) paint fairly bleak pictures for coastal communities. ... They outline several ways that coastal communities are experiencing the impact of climate change before communities that are farther inland. Our salmon are at risk In our region, salmon is one of the most important species. While in the Strait, salmon are the preferred prey of Southern Resident killer whales. When spawning in freshwater rivers, salmon feed bears and other species along the watersheds, contributing energy to the food chain and nutrition to the soil. Yet higher average air and water temperatures, including record high temperatures in the Fraser River, are already contributing to a significant decline in salmon spawning survival in our region. Our weather is changing Local economies and communities depend on regular precipitation patterns to be able to provide potable water and maintain winter wonderland conditions. However, changing patterns of precipitation, such as dry winters, lead to a decline in snowpack, while BC experienced its most extreme wildfire season the summer of 2017, with 1.2 million hectares burned by upwards of 1,300 fires. What can we do? We know that climate change is real, we know that we are causing it, and we know that we are running out of time to stop it. Canada has made many commitments to slow and stop our greenhouse gas emissions, but we have missed each and every one of these targets. The 2017 country review of Canada, issued by the Organization for Economic Cooperation and Development (OECD), shows that the oil and gas sector is our largest culprit. It is not transportation, not the built environment or agriculture (although those sectors aren’t without impact) that is our biggest dragon to slay, but our mining and production of fossil fuels for export and domestic use. In the Salish Sea, we are uniquely placed in Canada. As coastal communities, we have a direct relationship to the direct impacts of climate change. We are also located in a corridor which the oil and gas sector wants to use to transport its product to tidewater. It is time to create a green barricade of resistance to any further impacts from new fossil fuel projects along our coast. And we are beginning to do that! Our next step is to say a definitive and legal “NO” to new fossil fuel infrastructure in the Salish Sea. We are working hard for a Moratorium on fossil fuels projects in the Salish Sea and doing our part to help Canada meet its international commitments and to slow global climate change. The 2016 Ontario Greenhouse Gas Progress Report describes some of the problems the province is already facing as a result of global warming. What used to be “normal” weather is gone. Ontario still depends on fossil fuels for 80% of its energy. Transportation is our biggest challenge: Ontario’s largest and fastest growing share of GHG emissions. Industry, homes and commercial buildings are other major emitters. Ontarians have high emissions per person, compared to most people around the world, even those in other rich northern countries. Ontario’s per capita GHG emission footprint (12.6 tonnes) compared to Sweden (5.8 tonnes), the UK (9.1 tonnes), Norway (10.6) and worldwide (4.9 tonnes). •the emissions we cause through international aviation and shipping. If these additional emissions were reflected in Ontario’s annual GHG totals, our reported emissions would be much higher. We have lots of room to improve, and many opportunities to do so. The good news is that Ford, from his viewpoint, has quickly solved Ontario's environmental problems. The bad news is he did it by shutting down the Environmental Commissioner office, which was established by the Ontario NDP government in 1994. The commissioner's office has existed for 24 years. It's tasked with reporting on the province's progress on energy efficiency and emissions reductions. The right-wing Ford government has shut down a green energy wind farm in Ontario while the right-wing Legault Quebec is looking at doing the same thing in Quebec. The White Pines project in Prince Edward county Ontario, which was close to completion after ten years of development and $100,000,000 included nine wind turbines meant to produce enough electricity to power just over 3,000 homes annually as Ontario shifted to renewable energy. Shutting it down was part of Ford's plan of closing 758 renewable energy projects. Ontario’s move to cancel the contract of a German-owned wind energy project represents a black mark for the province in the eyes of foreign investors, Berlin’s ambassador to Canada, Sabine Sparwasser, warned Monday. The Progressive Conservative government announced the cancellation of the 18.5-megawatt White Pines project two weeks ago and introduced legislation last week to allow the termination and to limit the compensation the province would face. Wpd Canada Corp. had been developing the project over the past 10 years, and received final approval for construction from the province’s Independent Electricity System Operator (IESO) in May, just after the election campaign began. That cancellation was separate from the government’s decision to terminate 758 renewable energy projects which had IESO contracts that had not been finalized. In Quebec, the Legault government is seriously considering down the $600 million Apuiat wind farm project that was intended to produce 200 megawatts from 50 wind turbines. The mayor of Port-Cartier, Alain Thibault, says that if this project is terminated by the government it will be hard to get further investments in the region. Hydro-Quebec would buy power from the wind farm under a provisional agreement made with the Innu Nation, a group that represents all nine Innu communities in Quebec, and Boralex in late August. It had been agreed to wait until after the Oct. 1 election to finalize the deal. The farm would cost $600 million to build and would create 400 jobs during the construction phase. First proposed in 2015, the wind farm became a political hot-potato during the Quebec election campaign. Philippe Couillard’s Liberals said the project was crucial to obtaining Innu support for future energy development on Innu traditional territory, while Coalition Avenir Québec (CAQ) leader Legault agreed with Martel, deeming the project uneconomical, given Quebec's surplus of hydroelectric power. 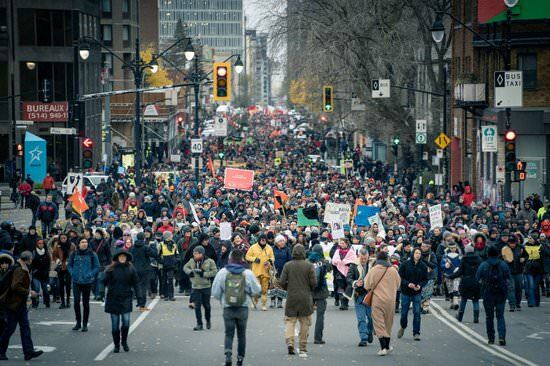 On Saturday November 10th, 50,000 Quebecois joined in a march called La planète s’invite au Parlement (The Planet Goes to Parliament) in order to demand that the Quebec government establish a concrete plan to deal with climate change. This demonstration was one of a series of marches called La planète s’invite dans la campagne aimed at insisting that all political parties develop a plan that prioritizes the "transition to green jobs, divest from fossil fuels, respect Indigenous sovereignty and protect their land and biodiversity." Andrew Scheer hope of winning more seats in Quebec are fading fast because of the Conservatives anti-carbon pricing approach to climate change. The 50,000 person march in Montreal last week to demand government action on climate change is just one example of the level of support for dealing with climate change now. Last week, 150,000 Quebecois signed a pledge to reduce their own carbon footprint and to insist that governments take a more proactive approach to global warming. This pressure is already affecting the new right-wing CAQ government and other provinical parties. When this is combined with the Ontario Ford government's abolishing of the Ontario's Office of the French Language Services Commissioner and the cancelling of a proposed Ontario French language univsersity that has raised another outcry in Quebec, the federal Conservatives are expected to see a significant drop in Quebec support in upcoming polls. In California, the climate change related wildfires have destroyed the city of Paradise, which had a population of 27,000. Searchers are now looking "for more than 1,000 people reported missing in the northern California town reduced to ashes by the deadliest wildfire in the state’s history, as the death toll increased to 71." Of the dead "only bones and fragments" remain. In California the current seven year climate change related drought, which was predicted by global warming models, has greatly facilitated the number and intensity of wildfires, as well as the speed at which they have spread, thereby increasing their deadliness. Those climate change models also predict that the Okanagan Valley and Southeast of BC, as well as the prairies of both Canada and the US, will also face the drought and high temperature conditions that facilitated these wildfires. Broadly speaking, however, climate change is making conditions more favourable for wildfires in the American west. Of the 20 largest wildfires in California’s recorded history, 15 have occurred since 2000, at a time when forests have become drier and warmer. Since 1970, temperatures in the west have increased by about double the global average, lengthening the western wildfire season by several months and drying out large tracts of forests, making them more fire-prone. “Given strong relationships between climate and fire, even when modified by land use and management such as fuel treatments, projected climate changes suggest that western forests in the United States will be increasingly affected by large and intense fires that occur more frequently,” the report adds, noting that fire suppression techniques have also heightened the risk. The complete inadequacy of the Saskatchewan government's August 2018 climate change plan, which "announced new emissions performance standards for more large industrial emitters that, if successful, are expected to reduce the province's overall emissions by 1.1 per cent by 2030", can be seen when it is compared to the IPCC Report. The government's plan looks at reducing emission intensity, as opposed to emissions themselves, he said. Forbes said that while today's announcement fills in some details, others remain elusive. "Today we saw an announcement that would deal with a very small part of the question," he said. 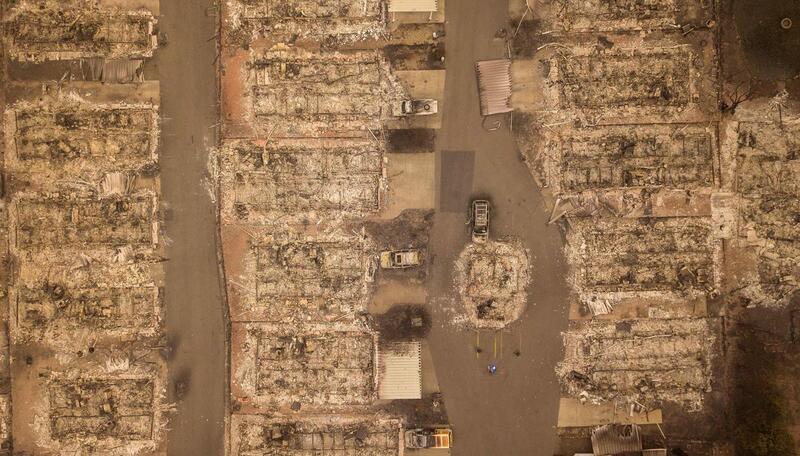 Considering what the damage and death toll created by the climate change-related California wildfires described in posts 268 and 269, you would think that the Canadian prairie provincal governments would start making major changes in their climate change plans. But, they remain in a state of denial. I do not agree with Hébert here. The logic does not support her in my opinion. It is true Quebec does not have a large percentage of climate deniers. However, it has had recently an even small percentage of conservatives. Even with a 70-30 proportion in the province in favour of those who that care about the environment, that leaves a 30% margin that may be inclined to vote Conservative for other reasons. In other words the 30% who would be most likely available to the Conservatives may also be aligned with them on terrible environmental policy. In this sense, they may have calculated that in the proportion it is realistic for the Conservatives to obtain, this move is a net positive. this number goes when you take out of the 70% those who may not agree with Conservative policies on this one issue but would vote for them anyway. As we have seen in the past, minority opinions can actually help parties get that minority of votes they need and be more effective than appealling to the majority that would not ever vote for them. People not only have positions on the issues but relative importance for the issues so a position alone is not certain to be able to move voters. This is a critical lesson for the NDP as well. There are times when it is politically positive to go with the majority, but sometimes that is not the case. The reality is that you need your policies to be in line with a majority of the people accessible to you. It is possible that while the Conservatives positions are not with the majority of the province, they are actually with the majority of their accessible voters there. There is little to be gained by having a position in common with other parties if that position will mostly please those who would never consider voting for you and leave those who would without a reason to come out for you. Consider that some policies will work to increase the vote of a party while the same policy would decrease the vote of another party. A classic example is the fiscal restraint of Mulcair, may have been a policy that could have helped the Liberals or the Conservatives but the policy damaged the NDP: the reason being that the people who wanted the policy were not open to the NDP and those who were opposed it. The NDP is at a severe deficit here and looks to continue that problem. Both the Liberals and the Conservatives know more about what their potential voters want on the issues (and what can cause them to change their vote) using up-to-date electronic communication tools recording canvassing (remember the Liberals with their ipads in the last election?). The NDP without the kind of connection and without the cash to build one, has to guess where its potential voters are. This is not the membership which are less likely to go anywhere. This is not about selling out either -- it is about making your message, shoring up arguments where needed, saving your breath also where possible -- in short, redirecting your communications more than even changes in policy. Without this intelligence it is in a severe deficit when it comes to tailoring the ads parties put out at the end of a campaign to bring home the vote. It is not clear that Hébert knows where the potential Conservatives are on this more than they do. It is possible that she is looking at the wide electorate while they are narrow casting to the people who could actually vote for them. They may know the issues their potential voters care most about, which issues they can afford to disagree with this group and still get support and which ones will generate votes in their favour. This is the technology in information that now can win elections. It does not matter where the general population is or where even the voting population (electorate is), it does not even matter, that strongly where the base is. What matters is not even where that 20-25% of accessible voters is on the issues. What does matter is which policies will move them - a subset. So from this small group we remove the people for whom party positions on the issue will not affect their vote (the people who can tolerate not being on the same side as their party). You might be left with only 10% of the electorate, 6% of the population, who will potentially change their vote on an issue. Knowing this for all the issues, for the potential voters, is how a party can win with minority opinions. Hébert's job is to follow the wider population and speculate about wider directions. She cannot narrow cast down to the small numbers on each issue and therefore can speak about trends but cannot be accurate about which single policy will make or break which party better than the parties. The advance in this information available to the Conservatives and Liberals is far beyond what a brillian journalist can do. So let me explain further: perhaps a 6 percent in quebec are fed up with policies supporting the environment, a further 20% could not care enough to vote on it and together these form the potential voters for the Conservatives. If this is the case it is a vote getter not a vote loser even if most of the province is in a different direction. This is the kind of thinking needed to win elections. ..from a piece i posted in another thread. this march was just the begining of something powerful coming up from below. no politician will be able to avoid oe ignore it. The EU has been steadily ratcheting up its targets as part of the 2015 Paris climate change accord. ... Last week the European parliament adopted energy-savings targets of 32.5% and a renewable energy uplift of 32% by 2030. That will put the bloc on course to cut emissions by 45% from 1990 levels by 2030. While Canadian greenhouse gas emissions have been rising since 1990, except for 2008-9 due to the Great Recession, the European Union has been reducing its emissions in a major way during the same period and has now set a goal of reducing its emissions by 45% below 1990 standards. On the other hand, the Liberal government, like previous Liberal and Conservative governments, is set to blow past its 2020 and 2030 targets for greenhouse gas emissions reductions. The reduction in greenhouse gas emissions over the 24-year period was due to a variety of factors, including the growing share in the use of renewables, the use of less carbon intensive fuels and improvements in energy efficiency, as well as to structural changes in the economy and the economic recession. By comparison greenhouse gas emissions grew in Canada under both Liberal and Conservative governments increased from 592 megatonnes carbon dioxide equivalent in 1990 to "in 2015 ... 722 megatonnes (Mt) of carbon dioxide equivalent", an increase of 22%. Canada has not and will not meet any of its greenhouse emission goals, although the European Union has shown it can be done. In 2015, Canada's total greenhouse gas (GHG) emissions were 722 megatonnes (Mt) of carbon dioxide equivalent (CO2 eq). The oil and gas sector was the largest GHG emitter in Canada, accounting for 189 Mt CO2 eq (26% of total emissions), followed closely by the transportation sector, which emitted 173 Mt CO2 eq (24%). The increase in GHG emissions between 1990 and 2015 was mostly due to a 76% (82 Mt CO2 eq) increase in emissions in the oil and gas sector and a 42% (51 Mt CO2 eq) increase in the transportation sector. These increases were partly offset by a 16 Mt CO2 eq decrease in emissions in the electricity sector and a 22 Mt CO2 eq decrease in emissions from heavy industry. Governments around the world are now being sued for failing to meet greenhouse emission targets and the October 2018 Intergovernmental Panel on Climate Change Report is giving plaintiffs new ammunition in these lawsuits. Already more than 1,000 such lawsuits have been filed. "Investors are also increasingly having to take into account the legal risks associated with global warming". “This report provides us strong arguments to use in the Court rooms: There is an important threat to people and their fundamental rights. By not stepping up their climate action, governments are failing to do their duty to protect citizens,” lawyer Roda Verheyen told EURACTIV. “Besides showing the devastating impacts of above 1.5°C warming, the IPCC report made it clear that limiting the temperature rise to 1.5°C is still possible and doable,” she stressed. The report, released on 8 October, demonstrates that limiting global average temperature rise to 1.5ºC is still achievable. Verheyen explained that plaintiffs are already being affected by climate change. “Plaintiffs are families who have to deal with heat waves, drought, too much water, not enough water, ice melt, rising sea level. They are people who are impacted by climate change now and on an every day basis,” the lawyer said. Many of them are farmers or depend on agriculture who are already feeling the impact of global warming on their activities. “For them, it is not a loss of revenue, it is also the loss of their fundamental right to live. Yes, climate justice is a human right,” she said. According to figures from the Sabin Centre for Climate Change Law at Columbia Law School, more than 1,000 climate cases have been filed worldwide, and confirms that these cases could have a significant impact in holding governments accountable for climate change. Of these 1,000 or more cases, 20 are directly targeting private companies. Already, the financial community is being sensitive to this new environment. Philippe Desfossé, chief executive officer of the pension fund ERAFP, the additional retirement pension for French civil servants worth €30 billion euros, recently told EURACTIV that investors increasingly have to take into account the legal risks associated with global warming. 27,000 homeless, 250,000 evacuated and 20 million on evacuation alert in California. Fire tornadoes incinerate Paradise in a single day. Only bones and fragments found. To see ice and polar bears disappear. Beneath the Gulf of St. Lawrence waves. African global warming refugees flood north. All of Australia becoming the Outback. Nations disappearing beneath the waves. India replies with a 2544 km wall where 900 migrants are shot and die. Bill McKibben, one of the world's top climate change experts and leader of 350.org, has just written an excellent article, in The New Yorker on where we are and where we are going because of global warming. How Extreme Weather is Shrinking the Earth discusses how global warming is decreasing the global space in which people can survive on the earth. Churchill, Manitoba, on the edge of the Hudson Bay, in Canada, is connected to the rest of the country by a single rail line. In the spring of 2017, record floods washed away much of the track. OmniTrax, which owns the line, tried to cancel its contract with the government, declaring what lawyers call a “force majeure,” an unforeseen event beyond its responsibility. “To fix things in this era of climate change—well, it’s fixed, but you don’t count on it being the fix forever,” an engineer for the company explained at a media briefing in July. This summer, the Canadian government reopened the rail at a cost of a hundred and seventeen million dollars—about a hundred and ninety thousand dollars per Churchill resident. There is no reason to think the fix will last . In October, New York State Attorney General Barbara D. Underwood filed suit against Exxon for lying to investors, which is a crime. What is certain is that the industry’s campaign cost us the efforts of the human generation that might have made the crucial difference in the climate fight. Exxon’s behavior is shocking, but not entirely surprising. Philip Morris lied about the effects of cigarette smoking before the government stood up to Big Tobacco. The mystery that historians will have to unravel is what went so wrong in our governance and our culture that we have done, essentially, nothing to stand up to the fossil-fuel industry. Such efforts help explain why, in 2017, the growth of American residential solar installations came to a halt even before March, 2018, when President Trump imposed a thirty-per-cent tariff on solar panels, and why the number of solar jobs fell in the U.S. for the first time since the industry’s great expansion began, a decade earlier. Among the anti-government ideologues and fossil-fuel lobbyists responsible was Myron Ebell, who was at Trump’s side in the Rose Garden during the withdrawal announcement, and who, at Frontiers of Freedom, had helped run a “complex influence campaign” in support of the tobacco industry. Ebell is a director of the Competitive Enterprise Institute, which was founded in 1984 to advance “the principles of limited government, free enterprise, and individual liberty,” and which funds the Cooler Heads Coalition, “an informal and ad-hoc group focused on dispelling the myths of global warming,” of which Ebell is the chairman. Also instrumental were the Heartland Institute and the Koch brothers’ Americans for Prosperity. After Trump’s election, these groups sent a letter reminding him of his campaign pledge to pull America out [of the 2015 Paris Agreement]. Even with a 70-30 proportion in the province in favour of those who that care about the environment, that leaves a 30% margin that may be inclined to vote Conservative for other reasons. In other words the 30% who would be most likely available to the Conservatives may also be aligned with them on terrible environmental policy. In this sense, they may have calculated that in the proportion it is realistic for the Conservatives to obtain, this move is a net positive. this number goes when you take out of the 70% those who may not agree with Conservative policies on this one issue but would vote for them anyway. As we have seen in the past, minority opinions can actually help parties get that minority of votes they need and be more effective than appealling to the majority that would not ever vote for them. People not only have positions on the issues but relative importance for the issues so a position alone is not certain to be able to move voters. Scheer now has problems on two major fronts with Quebecois voters: with his anti-carbon pricing policy and with Ford's cutting of the French language university and the French language services commissioner in the budget update. The latter is causing an increasing level of anger among Francophones not just in Ontario, but also in Quebec, New Brunswick and Manitoba that could create electoral problems for Scheer. Even Rachel Curran, director of policy under former prime minister Stephen Harper, admitted as much on CBC's Power and Politics. The intersection of the view that federal Conservatives are not willing to vigorously fight for the protection of the French language with policies that are not viewed favourably in Quebec, such as being against measures to reduce greenhouse gas emissions, increases the tendency to see Conservative views on issues as alien to Quebec culture, thereby affecting the Conservative chances of doing well in the next election in Quebec. Quebec's French-language media — which normally would pay little attention to a provincial fiscal update in Ontario — also jumped on the news. Le Devoir reported the decision under the headline, "Doug Ford sacrifices Ontario francophones." Le Journal de Montréal, a widely-read and generally conservative-leaning paper, called it a "sad day." Quebec Premier François Legault, a small-c conservative himself, also expressed his concerns and said he would take up the issue with his Ontario counterpart. The mayor of Quebec City — the municipality at the centre of the region where most of the Conservatives' seats in the province are located — denounced the move as mean-spirited and provocative. Scheer has very publicly allied himself with Ford, Manitoba Premier Brian Pallister, Saskatchewan Premier Scott Moe and United Conservative Party Leader Jason Kenney (who may become Alberta's premier after next spring's provincial election) in his fight against Trudeau's carbon tax. He may prove reluctant to take Ford to task over a separate issue that he'd prefer to avoid altogether. That alliance could compound the potential for problems facing Conservatives in Quebec. Quebec will not be affected by the federally-imposed carbon tax; the province already has a cap-and-trade system in place. But voters in Quebec are worried about climate change. Polls show that it rates as an issue most highly in Quebec, putting the environment and climate change among the top issues for voters in the province. The Liberals' plan to put a price on carbon is also more popular in Quebec than anywhere else in the country. A recent Angus Reid Institute poll put approval of the plan at 69 per cent. Mainstreet Research not only found support for the plan higher in Quebec than elsewhere, it reported that 77 per cent of Quebecers told the polling firm they strongly or somewhat agreed that "it is more important for the government to solve the issue of climate change even if that means that the economy suffers." That puts Scheer at risk of being out of step with Quebecers in the next federal election on one major issue — a risk that could be amplified if francophones also sense the Conservative leader is unwilling to distance himself from Ford's approach to funding services for Franco-Ontarians. Jerry M -- Please fix your last post as it is very unclear who is saying what. In any event, I think that the Ontario actions are ging to hurt Conservatives - at least in the short term. I disagree that they will pay a heavy price for their environmental positions in Quebec. The reason as I said is they are only in a contention with a minority that is not hostile to this position. This is the point of how politics are working now -- parties are casting narrowly towards demographics. There is no large majority of the population engaged on most issues. Parties know more and more their potential voters and what moves them. You underestimate them at great risk of loss to them. Last month, before the Paradise fire happened, five wildfire experts looked at what BC could learn from the California wildfires, which are expected to be much more frequent in both places in the future because of global warming. Below is an article on that discussion. One thing they did not cover was the importance of looking at whether there are sufficient escape routes for rapidly spreading fires. Paradise had only two roads out of town because of its mountain location, a factor that contributed to the large death toll in this fire. Mountainous BC has some similarly located communities. Some people also had close escapes from the Fort McMurray fire in 2016. More attention needs to be paid to this issue. Wildfires in British Columbia could become just as deadly within 20 years as those burning now in California, says top Canadian forestry expert Bruce Blackwell. While British Columbia’s 2018 wildfire season burned more than double the land of California’s, no lives were lost in British Columbia from fire or during evacuations in the last two fire seasons. In contrast, 14 people died, and another 41 were injured during California’s latest wildfire season. "I think the pace of [housing] development, in combination with the growing probability of wildfire, are on a collision course where we will continue to see growing levels of wildfire damage, potential loss of life, and unsustainable suppression costs that will overwhelm our capabilities to recover in the short term and impact the quality of life of all British Columbians," stated Blackwell. Scott Stevens, fire science professor at University of California, Berkley, said that the fatalities in California were due to developing homes in fire prone areas without taking the necessary precautions to prevent future fires. ... The panelists were in unison that prescribed burns are necessary to prevent future fires, and that B.C. needs to increase the amount it burns. Prescribed burns are controlled forest fires in a specific area, aimed at reducing fuel that spreads fire. Blackwell recalled that before the 1990s, “we used to burn about 485,000 hectares of land a year. That number through the nineties declined to where we’re burning, on average, less than 20,000 hectares a year.” Blackwell noted that in B.C., wildfires spread through areas that would have historically been subject to a prescribed burn. He said a drastic decline in prescribed burning is a result of negative public perception and from a concern for health. Smoke particulates in the air are harmful for those with asthmatic condition and respiratory diseases. Like California, BC and the prairies are setting records in the number, intensity and size of wildfires as the climate warms and dries due to global warming. It's the new abnormal. California is on the burning edge of climate breakdown. Record-breaking drought and heat have turned the Golden State into a tinderbox. The megafires have followed. In the last two years a string of off-the-chart wildfires have exploded with stunning speed and ferocity across forests, grasslands, rural areas and city neighborhoods. California Governor Jerry Brown has called it "the new abnormal." To illustrate this new abnormal, I’ve charted California’s biggest and most destructive wildfires since modern records started being kept around 1930. "New normal” implies a new predictable plateau that we can get used to. Something different but ultimately … “normal.” That is not what is happening. Let’s start by looking at the state's list of top-20 largest fires. My chart below arranges them by year. The height of each bar shows the number of acres burned. The red bars are the fires from 2017 and 2018. Two things jump out. First, you can see that California's megafires are becoming much more frequent. These gigantic fires used to be rare events. Now Californians are struggling against them with dizzying frequency. Second, you can see how they suddenly leap off-the-charts in scale. Less than a year ago I wrote about 2017's freakish Thomas Fire. It not only became California's chart-topping wildfire, it did it during the month of December during California's "rainy season." It was the first “rainy season” fire to burn its way into the top-20. David Suzuki recently discussed how to deal with the polarized opinions on global warming. Canadian climate-change opinion is polarized, and research shows the divide is widening. The greatest predictor of people’s outlook is political affiliation. This means people’s climate-change perceptions are being increasingly driven by divisive political agendas rather than science and concern for our collective welfare. Over the past year, the Alberta Narratives Project gathered input from a broad range of Albertans (teachers, faith groups, health professionals, farmers, artists, industry, environmentalists, etcetera) to better understand how they feel about public discourse on global warming. Participants said they want less blame and a more open, balanced, and respectful conversation. Many don’t see themselves in the conversation at all. No one is speaking to them, using language that reflects their values and identity. Albertans are deeply divided in their climate-change perceptions. In 2017, just over half the population was doubtful or dismissive. When an issue is highly polarized, people find it difficult to discuss. The Alberta Narratives Project found people rarely, if ever, speak to others about climate change. Rising populist politics are weaponizing climate action as a wedge issue for political advantage—with tragic implications. How can we reverse this? Cities are responsible for 70 percent of global emissions. According to C40 Cities research, they can lead the way by acting across four key areas: energy supply, buildings, mobility, and waste. To tackle climate change, we must heal the divide and act—as individuals, families, neighbours, communities, and societies. We can’t afford to wait. Disclosures and analysis of transaction-level data reveals that EDC provides, on average, over $10 billion in government-backed support for oil and gas companies every year. Between 2012 and 2017, EDC provided twelve times more support for oil and gas than it did for clean technologies. Justin Trudeau has a problem. How can Canada meet our international climate commitments so recently inked in Paris with an increasingly empty economic larder? The International Monetary Fund may have the answer. Last summer, the IMF updated its global report on energy subsidies and found that Canada provides a whopping $46.4 billion in subsidies to the energy sector in either direct support or uncollected taxes on externalized costs. Globally, this figure balloons to US$5.3 trillion or 6.5 per cent of the world’s GDP. To put that enormous sum in perspective, the global giveaway to the energy sector amounts to 40 times more money than is contributed in aid to the world’s poorest people. For instance, $30 billion of our total subsidies flagged by the IMF are for petroleum. Canadians buy around 58 billion litres of gas and diesel each year. Covering all externalized costs of that fuel use would require additional taxes of about $0.50 per litre, a tall order even for a politician of Trudeau’s current popularity. Meanwhile, today the United Nations World Meteorological Organization (WMO) announced that the levels of greenhouse gases in the earth's atmosphere rose to a new record high of 405.5 parts per million in 2017. Greenhouse gas emissions have risen 41% since 1990 causing the WMO to warn that the window of opportunity to act against climate change "is almost closed." "The science is clear. Without rapid cuts in CO2 and other greenhouse gases, climate change will have increasingly destructive and irreversible impacts on life on Earth," WMO Secretary-General Petteri Taalas said. The data released by the WMO comes after an October report by the Intergovernmental Panel on Climate Change (IPCC), which showed that net CO2 emissions must reach zero around 2050 in order to limit temperature increases. A temperature increase of under 1.5 degrees Celsius (2.7 degrees Fahrenheit) would reduce the consequences of global warming for humans and ecosystems. Both the reports will be the foundation for the UN climate change negotiations, which will take place in Katowice, Poland from December 2-14. The negotiations aim to set down the guidelines for the implementation of the Paris Climate Change agreement, which aims to keep the global temperature increase as close as possible to 1.5 degrees. "There is currently no magic wand to remove all the excess CO2 from the atmosphere," said WMO Deputy Secretary-General Elena Manaenkova in a statement. "Every fraction of a degree of global warming matters, and so does every part per million of greenhouse gases." Today, driven by the strong and growing Quebec climate change movement, the province's three opposition parties formed a common front in demanding emergency action be taken by the CAQ government to deal with climate change. The growing pressure on the Quebec government is the result of the massive mobilization of Quebecois to fight climate change. Many thousands of Quebecers have mobilized to demand decisive measures to fight climate change as Premier François Legault’s new government and opposition legislators prepare to convene for the first time since the Oct. 1 election. About 214,000 signatures were registered in two weeks on an online pledge to reduce personal carbon footprints and to demand proactive political leadership on climate change. And hot off the heels of the largest environmental march in Montreal in six years, a gathering is planned outside the National Assembly in Quebec City next Wednesday, the day that Legault will give his inaugural address. The Pact for Transition asks the Quebec government to stop all new fossil fuel exploitation in the province, abolish fossil fuel subsidies, ensure that Quebec reaches its climate target of 20 per cent less greenhouse gas emissions in 2020 compared to 1990 levels, and commit to reducing greenhouse gas emissions by 50 per cent by 2040. The group behind a 50,000-strong Montreal demonstration earlier this month, The Planet Goes to Parliament, has a similar suite of demands and asks the government to commit to reducing greenhouse gas emissions by 45 per cent by 2030 before fully stopping them by 2050. “The idea is to make François Legault feel that the whole population is listening and waiting for a response to our demands,” explained Isabelle Dupras, a spokesperson from The Planet Goes to Parliament. The volunteer citizens group is providing transportation to the provincial capital from Montreal and Brome-Missisquoi, a municipality in southern Quebec that borders Vermont, on Nov. 28. Greenpeace Quebec spokesperson Patrick Bonin told National Observer on Wednesday that the recent mobilizations in Quebec is the result of various factors. Among them are the release of the United Nations Intergovernmental Panel on Climate Change (IPCC) special report on Oct. 8; a deadly heatwave that killed 89 Quebecers in the summer; Prime Minister Justin Trudeau’s decision to purchase the Trans Mountain pipeline; and the polarizing environmental stances of parties in Quebec election campaign. In a “warm and open” meeting with Legault on Nov. 9 to discuss the Pact, Champagne said the premier acknowledged that he had “got the message” that climate action mattered for Quebecers, in part because of the traction gained by Québec solidaire in the recent election. The United States Global Change Research Program, which consists of a team of more than 1,000 researchers from 13 federal agencies, issued a report today that documents the human and economic impacts of global warming. The report warned that the costs would reach hundreds of billions annually by 2100 and in the worst case scenario reduce the GDP by 10%, as well as having wide impacts on peoples' health. Since 85% of Canadians live within 100 miles of the US border, most will face the same economic and health problems as those of the neighbouring northern US states. Humans are living with the warmest temperatures in modern history. Even if the best-case scenario were to happen and greenhouse gas emissions were to drop to nothing, the world is on track to warm 1.1 degrees Fahrenheit. As of now, not a single G20 country is meeting climate targets, research shows. Without significant reductions in greenhouse emissions, the annual average global temperature could increase 9 degrees Fahrenheit (5 Celsius) or more by the end of this century, compared with preindustrial temperatures, the report says. There will be more mosquito- and tickborne diseases like Zika, dengue and chikungunya. West Nile cases are expected to more than double by 2050 due to increasing temperatures. Expect asthma and allergies to be worse due to climate change. No one's health is immune from climate change, the report concludes. People will be exposed to more foodborne and waterborne diseases. Particularly vulnerable to higher temperatures in the summer, children, the elderly, the poor and communities of color will be at a much greater risk for illness and death. Wildfire seasons -- already longer and more destructive than before -- could burn up to six times more forest area annually by 2050 in parts of the United States. Burned areas in Southwestern California alone could double by 2050. ... Along the US coasts, public infrastructure and $1 trillion in national wealth held in real estate are threatened by rising sea levels, flooding and storm surges. Energy systems will be taxed, meaning more blackouts and power failures, and the potential loss in some sectors could reach hundreds of billions of dollars per year by the end of the century, the report said. The number of days over 100 degrees Fahrenheit will multiply; Chicago, where these days are rare, could start to resemble Phoenix or Las Vegas, with up to two months worth of these scorching-hot days. Volume I and II of the United States Fourth National Climate Change Assessement that is referred to in the previous post and Volume II, which has just been released, can be viewed at the urls below. The third url looks at the effects of global warming on the regions of the United States.Since the Alaska, Coasts, Great Plains, Midwest, Northeast, and Northwest regions all border on Canada, the climate change findings for these regions will also impact Canada. Was it a coincidence that this report was released on Black Friday? Not at all. The 2018 United States Fourth National Climate Change Assessement report was scheduled to be released in December. Releasing bad news on Friday is done by many organizations as coverage tends to be less and in the modern 24 hour news cycle, its old news by Monday. Releasing the report on Black Friday was aimed at getting the report even less coverage because of the holiday weekend. For government agencies and corporations with bad news they are reluctant to put out, there’s long been a tradition in public relations called the Friday news dump. In essence it’s a way of saying, OK, fine, we screwed up somehow, but let’s wait to admit to it until the last possible moment so fewer people will hear about it. While those all sound like serious and important news stories none of them are going to matter if civilization as we know it comes to an end. In a vastly more alarming news dump on Black Friday, the busiest shopping day of the year, the Trump administration released the findings of a major climate science report. Cynics would say that this was done in order to bury one of the most detailed and comprehensive reports of its type. The 1,656-page National Climate Assessment, which is mandated by the US Congress, is a peer-reviewed report from scientists from 13 federal agencies. They conclude that the impacts of climate change are already here and are projected to intensify. Climate change is expected to bring more of the types of natural disasters we’ve seen across the US this year, including deadly wildfires in California and rising sea levels on the coasts, the report says. The report concludes that “the evidence of human-caused climate change is overwhelming and continues to strengthen, that the impacts of climate change are intensifying across the country, and that climate-related threats to Americans’ physical, social and economic well-being are rising”. The United States Fourth National Climate Change Assessement reports that global warming has cost the US economy nearly $400 billion in just the last three years. Furthermore, many US economists agree with the reports findings. The Canadian government needs to start determining and reporting how much economic damage is being done to Canada by global warming. Throughout the 29-chapter report, scientists provide three scenarios that the United Nations’ climate assessments use. One is the business-as-usual scenario, which scientists say is closest to the current situation. That is the worst case of the three scenarios. Another would envision modest reductions in heat-trapping gases, and the third would involve severe cuts in carbon dioxide pollution. For example, the $155 billion a year in extra labor costs at the end of the century is under the business-as-usual scenario. Modest reductions in carbon pollution would cut that to $75 billion a year, the report said. The report talks of hundreds of billions of dollars in economic losses in several spots. In one graphic, it shows the worst-case business-as-usual scenario of economic costs reaching 10 percent of gross domestic product when Earth is about a dozen degrees warmer than now with no specific date. A network of young people in Quebec have applied to sue the Canadian government for failing to get tough on the carbon pollution that is heating the planet and putting their futures in jeopardy. Environnement Jeunesse applied Monday to bring a class action lawsuit against the Government of Canada, on behalf of all Quebecers aged 35 and under. The group is being represented pro bono by Montreal-based law firm Trudel Johnston & Lespérance. Canada is infringing on the fundamental rights of these young people, the group alleged — rights that are protected by both the Canadian Charter of Rights and Freedoms and the Quebec Charter of Human Rights and Freedoms. A Quebec Superior Court judge will now have to decide whether to authorize the class action before the group can move forward with a trial, Anne-Julie Asselin, a lawyer at the firm, told National Observer. She expected that this step would take about a year. The moves comes after thousands of Quebecers mobilized to demand measures to fight climate change, like halting all new fossil fuel exploitation in the province. The group is hoping to emulate the success of the Urgenda Foundation campaign in the Netherlands, whose case forcing the Dutch government to accelerate its emissions cuts was upheld in a Hague court last month. The severity of the climate crisis demands that the cuts be deeper, judges there ruled. “Similar legal actions are ongoing in the United States, Belgium, Norway, Ireland, New Zealand, Switzerland, Colombia and the United Kingdom,” the law firm notes on its web page detailing the class action. The firm has pointed to several examples of how weak climate targets infringe on rights in Canada. The right to life, integrity and security of the person, for example, is protected by section 7 of the federal charter and section 1 of the Quebec charter. Last week the NDP BC government announced it plans to introduce legislation by the spring requiring all new cars and trucks be zero emission vehicles by 2040, making it the strongest such legislation in North America. "Having a single stand-alone carbon price strategy is a bit like saying the way to raise a child is to buy the child a winter coat - and that is it. The findings of 206 studies of 6 carbon price countries and two Canadian provinces indicated the carbon emission intensity nd energy use affected by the price of carbon is less than one per cent." A UN report released on Tuesday found that the current emission targets for all countries would result in an average global temperature rise of 3.2 degrees Celsius by 2100 causing global dire consequences. We need to decrease emissions by 25% by 2030, according to the UN's October 2018 report in order to have a chance of keeping the global temperature rise to 2.o degrees Celsius by 2100. However global emissions increased in 2017, instead of decreasing. In fact, the report states that the current emission targets for all countries would result in an average global temperature rise of 3.2 degrees Celsius (5.8 degrees Fahrenheit) by 2100. A 3.2 degree warmer world by the end of this century would bring about many of the dire consequences for human health, global economies and sea level rise that are projected from the "higher-emission" scenarios (also known as worst-case scenarios). This year's report shows the largest gap ever, resulting from increasing emissions and slow action to mitigate. The foreboding message in the report aligns with the recent findings in the "Special Report on 1.5 Degrees" issued last month by the Intergovernmental Panel on Climate Change (IPCC), that the world is failing to act fast enough to avoid the dire future climate and weather and time is quickly running out. According to Tuesday's report, global emissions of CO2 in 2017 were 53.5 gigatons (a gigaton is 1 billion tons), the most ever released into the atmosphere, representing an increase of more than 1% over 2016 emissions. Global emissions need to be 25% lower than this figure by 2030 in order to limit warming to 2 degrees Celsius and 55% lower in order to limit to 1.5 degrees, the report claims. The increase in 2017 follows relatively stable global emissions from 2014 through 2016, a period that allowed for optimism that global greenhouse gas emissions may be peaking. But Tuesday's report shatters that optimism. "Global peaking of emissions by 2020 is crucial for achieving the temperature targets of the Paris Agreement," the report states, "but the scale and pace of current action remains insufficient." Global emissions are not expected to peak by 2030, let alone 2020. In fact, only those of 57 countries (representing 60% of global emissions) are projected to peak by 2030. The authors of the report conclude that nations must be more ambitious in their projected emission cuts, increasing them by three times in order to meet the 2 degrees goal and by five times to meet the 1.5 degrees goal by 2030. Knowing that level of action is extremely unlikely, the 2018 Emissions Gap Report points to the growing potential of "non-state actors" to help reach global emissions goals. These include smaller governing bodies such as city, state and regional governments, as well as private entities such as companies, investors and civil organizations. Although the federal Liberal government portrays itself as a global leader in fighting climate change, a new study published in the journal Nature Communications, that assesses each countries' greenhouse gas emission goals, finds that Canada's greenhouse gas emissions goals are some of the weakest. If all countries followed Canada's reduction goals, global temperatures would rise by 5 degrees Celsius, basically frying the planet. Canada’s current climate policies are "very insufficient" and would help increase global temperatures by a catastrophic 5 C by the end of the century, according to a new study that ranks the climate goals of countries around the world. The study found that Canada, along with Russia, China, Argentina, Saudi Arabia, South Africa and a dozen other countries, are dangerously contributing to the global temperature rise, and is on course to vastly exceed the 1.5 C that scientific research assessed by the IPCC found is a moderately safe level of global warming. The U.S., Australia and the European Union are not far behind in the ranking. The EU countries are often portrayed as being among the leaders in fighting climate change. The new study, published on Nov. 16 in the journal Nature Communications, assesses each nation’s ambitions and goals to reduce greenhouse gas emissions and the temperature rise that would result if the world followed their example. A supplementary data visualization website called Paris-Equity-Check.org presents these results. The study's author Dr Yann Robiou du Pont from the University of Melbourne’s Australian-German Climate and Energy College said its aim is to help inform politicians and climate leaders as the United Nations begins a two-year process of re-assessing global climate commitments, which numerous studies have now found fall far short of the 1.5-2 C goal set in the 2015 Paris Agreement. The Paris agreement set a deadline of 2018 for all signatories to adopt a work program for the implementation of their emissions reduction commitments which will include a financial plan for climate action worldwide. At the time, Prime Minister Justin Trudeau committed to achieve an economy-wide target to reduce Canada's greenhouse gas emissions by 30 per cent below 2005 levels by 2030. But, in order to meet the Paris Agreement, Canada should be looking to decrease their emissions by nearly 70 per cent, said Robiou du Pont. While the federal Liberal government's greenhouse emission goals have been judged to be some of weakest of all countries in a climate change study (see the previous post), the Ontario Ford government's plan released on Thursday is much weaker still and is greatly lacking in detail. As might be expected from a conservative government, it largely involves incentive giveaways to corporate polluters to reduce their greenhouse gas emissions. The Ford government is also joining Saskatchewan in a $30 million lawsuit with the federal government over carbon pricing. The government plans to spend $400 million over four years through a new Ontario Carbon Trust. It includes $350 million that would leverage private investment in clean technologies at a 4:1 ratio. The details of the trust are still being finalized, so how much industries will pay into the fund "will depend on the final design and mandate of the trust," according to the plan. Another $50 million is set aside for a reverse auction, modelled after Australia’s Emissions Reduction Fund, to encourage businesses, farmers and land owners to bid on government contracts to develop environmentally friendly practices and technologies that produce the lowest cost per tonne of greenhouse gas emissions. Climate experts, however, say that emissions are likely to continue to increase in Australia. "The Ontario Carbon Trust should be able to leverage over $400 million to unlock over $1 billion of private capital, " the announcement said. The remaining $100 million will be invested in green energy innovation and conservation efforts. NDP MPP and energy critic Peter Tabun noted these reports in his remarking that the plan is "scandalously thin" and would take Ontario down "a path to disaster. These targets are totally reckless and take us into the danger zone that we don't want to be in," Tabuns told reporters. "If you have a forest on fire, worrying about an individual shrub is not enough...Under cap and trade you were generating billions of dollars a year to take action on climate change and their trust is what, $350 million over the next few years. The scale of what has to happen does not match at all." Tabuns added that commending Ontario's alignment with Canada's commitment to the Paris agreement ignored the fact that "we need higher targets" to avoid the catastrophe detailed in the UN Intergovernmental Panel on Climate Change report, which warns there are 12 years left to take serious action before hitting dire consequences. "We need higher targets, we need a consistent plan with investment by government and regulation by government that would actually substantially reduce emissions year over year," Tabuns said. Ontario Environment Minister Rod Phillip said Ontario's greenhouse gas emissions reduction plan of corporate giveaways was partly based on Australia's plan, whose "emissions record is terrible. In the week before Christmas (2017) the government yet again released its latest data on greenhouse gas emissions in the hope they would be missed amid other news and the nearing festivities." And you don’t need to be a Rhodes scholar presiding over a party room full of climate change deniers to know why. Putting a price on carbon provided an incentive for firms to use less of it. Removing that price removed the incentive.